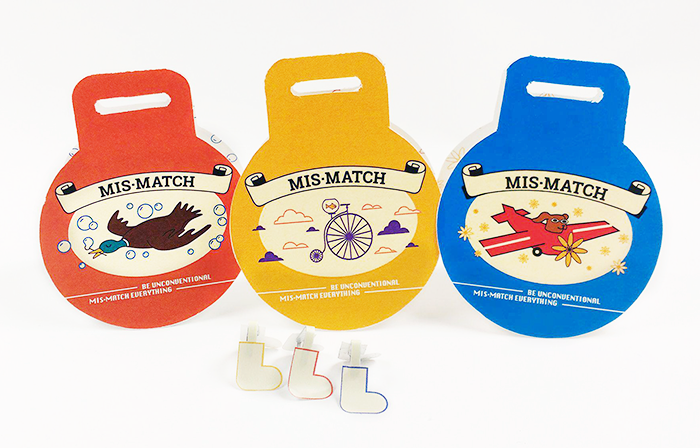 Mis-Match is a sock brand that focuses on matching unconventional items together to create new ideas and spark imagination. 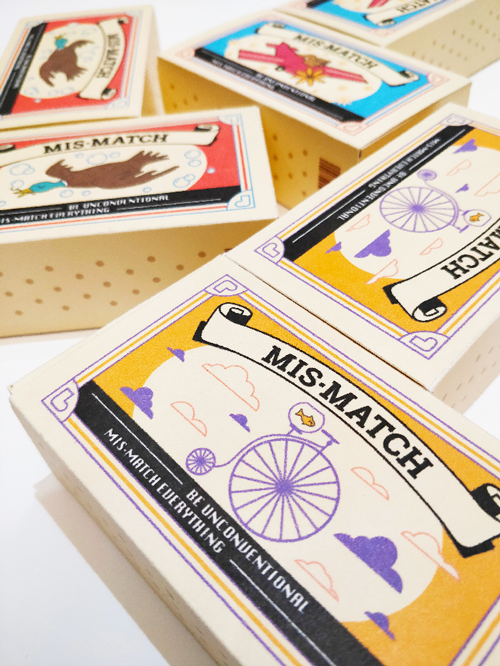 The packaging is influenced by vintage match box design, however, contains two pairs of socks. 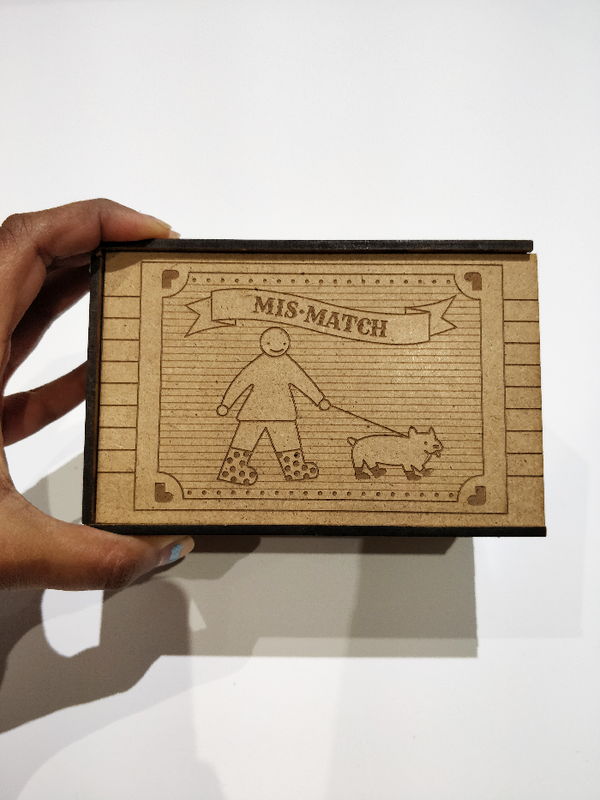 It incorporates both ideas of match boxes and mis matched pairs of socks, resulting in a creative brand. 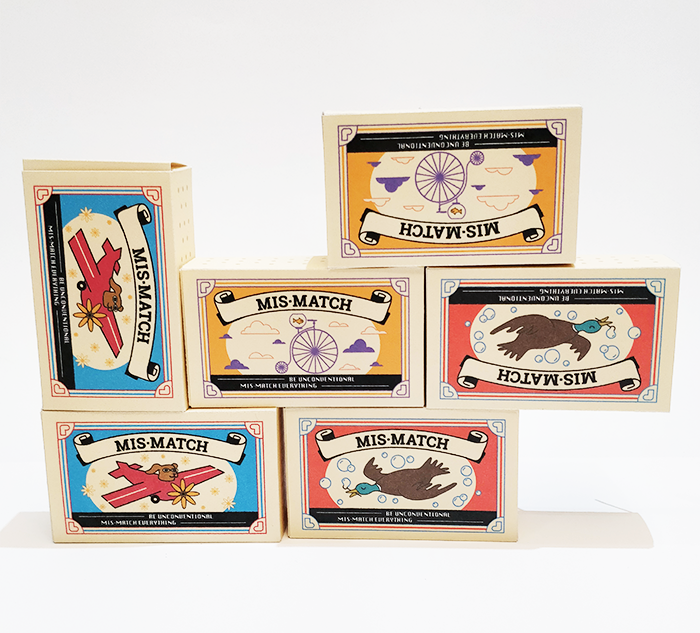 Mis-Match is a sock brand that focuses on matching unconventional items together to create new ideas and spark imagination. 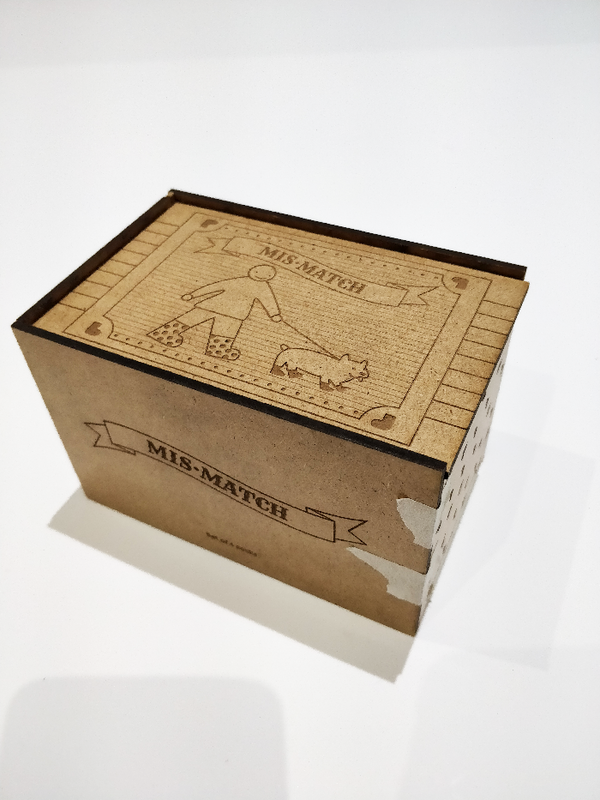 The packaging is influenced by vintage match box design, however, contains two pairs of socks. 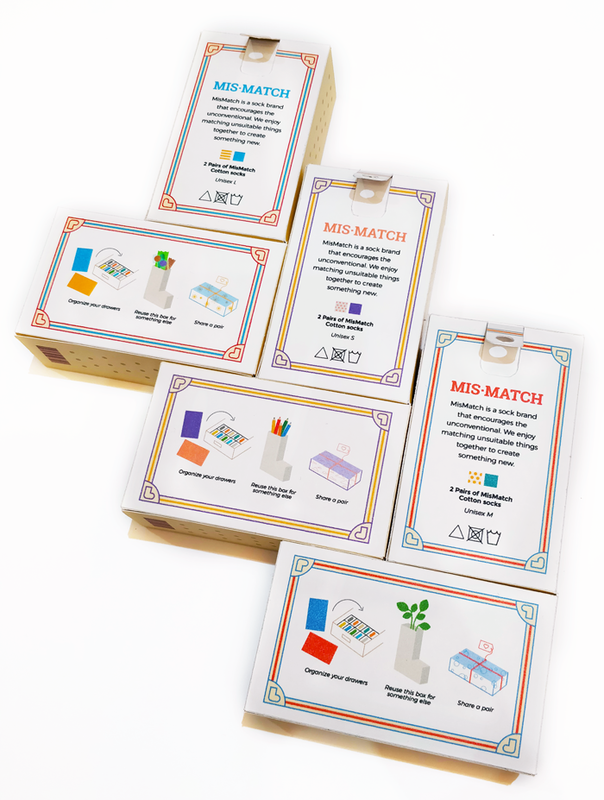 Mis-Match incorporates both ideas of match boxes and mis matched pairs of socks, resulting in a creative brand. 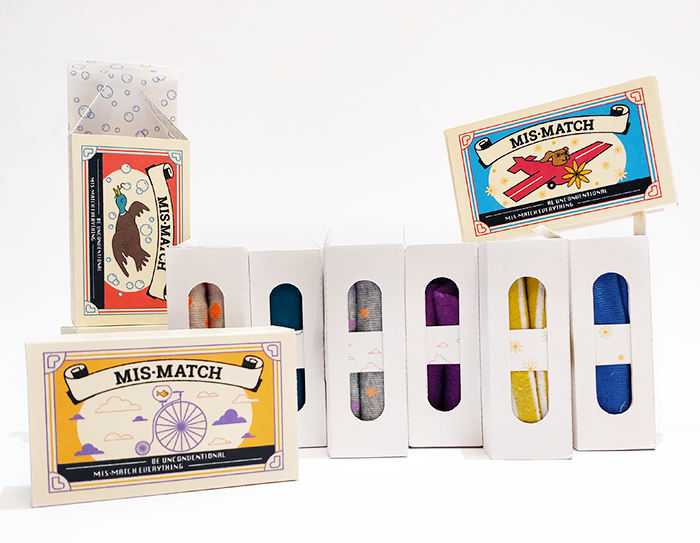 Mis-Match is a sock brand that focuses on matching unconventional items together to create new ideas and spark imagination. 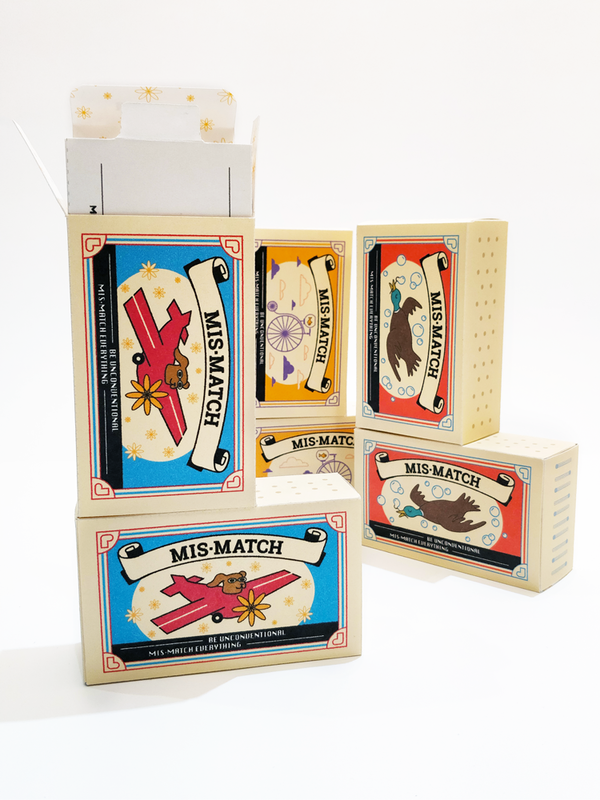 The packaging is influenced by vintage match box design, however, contains two pairs of socks. 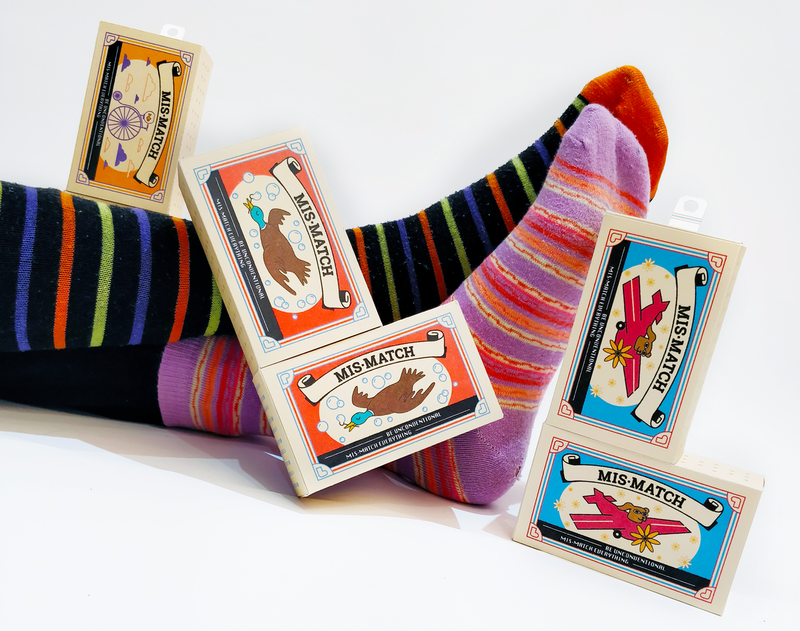 Mis-Match incorporates both ideas of match boxes and mis matched pairs of socks, resulting in a creative brand. 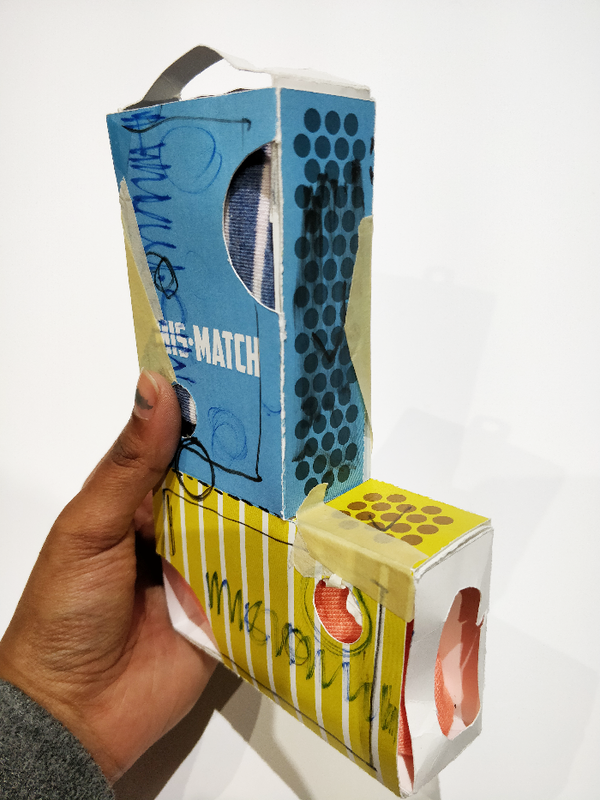 My professor challenged me to merge match boxes and socks as a package idea. Often people mix up their socks and cannot find the other pair. 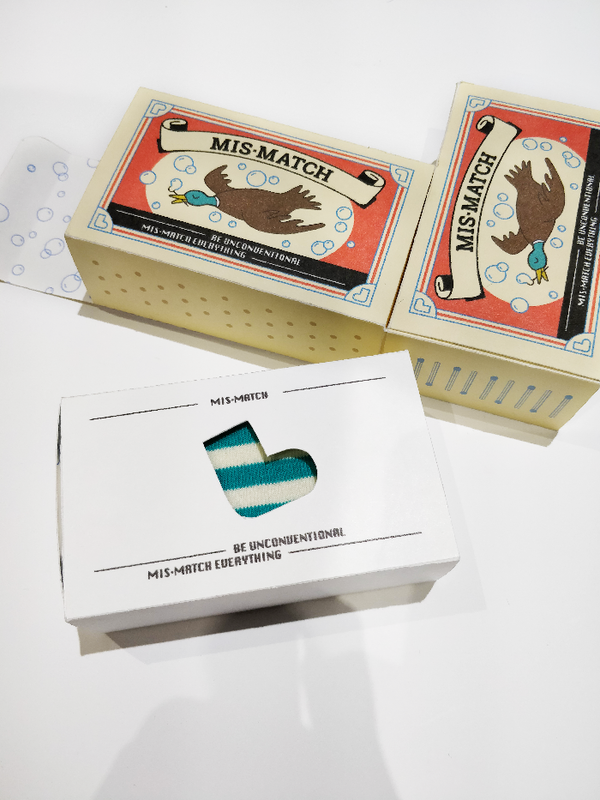 Mis-Match embraces this idea and encourages mis-matching socks as well as helps consumers organize their drawers. This is to better aid them in finding a certain pair of socks when they need it, serving as a functional package in the home. This design focuses on using playful illustrations and bright colours to attract a range of different consumers such as; children, people with a love of vintage design and socks enthusiasts. a random suggestion that became a challenge. Often people mix up their socks and cannot find the other pair. 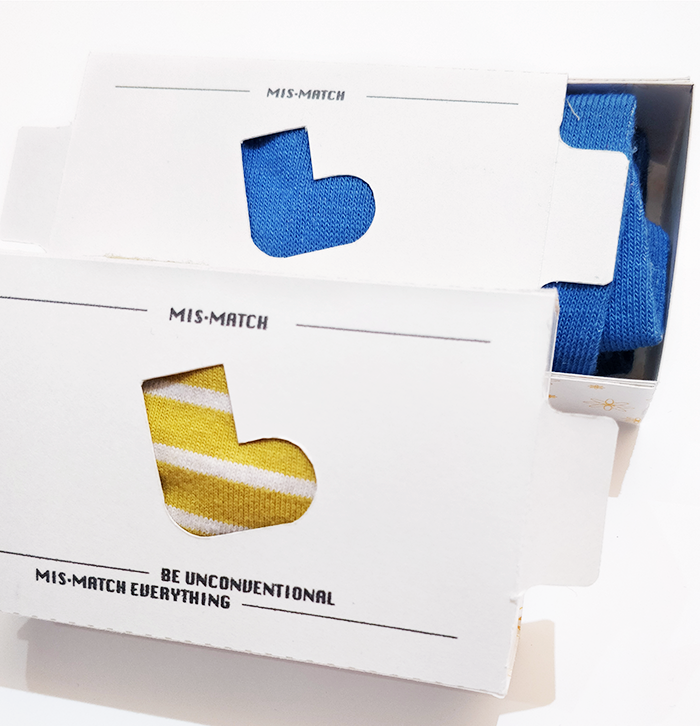 Mis-Match embraces this idea and encourages mis-matching socks as well as helps consumers organize their drawers. This is to better aid them in finding a certain pair of socks when they need it, serving as a functional package in the home. This design focuses on using playful illustrations and bright colours to attract a range of different consumers such as; children, people with a love of vintage designand socks enthuses. 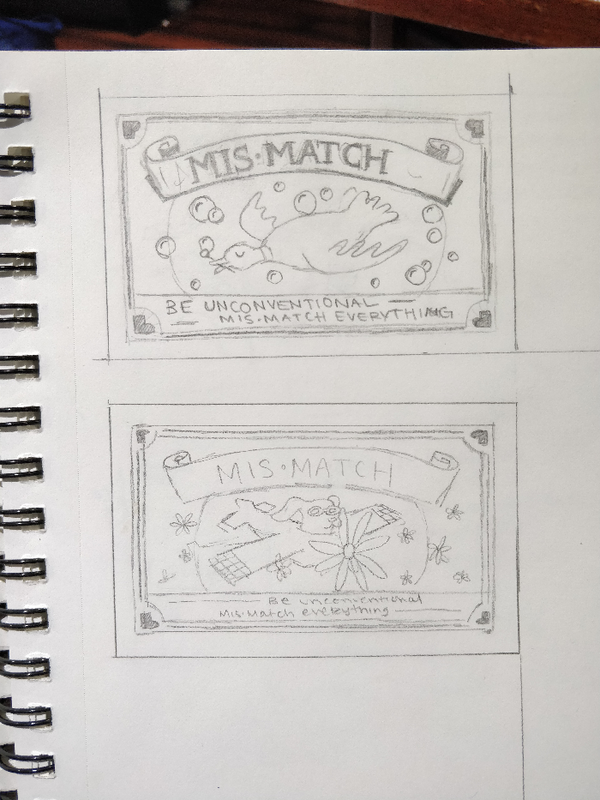 The intial idea of merging match boxes and socks came from a random suggestion that became a challenge. Often people mix up their socks and cannot find the other pair. 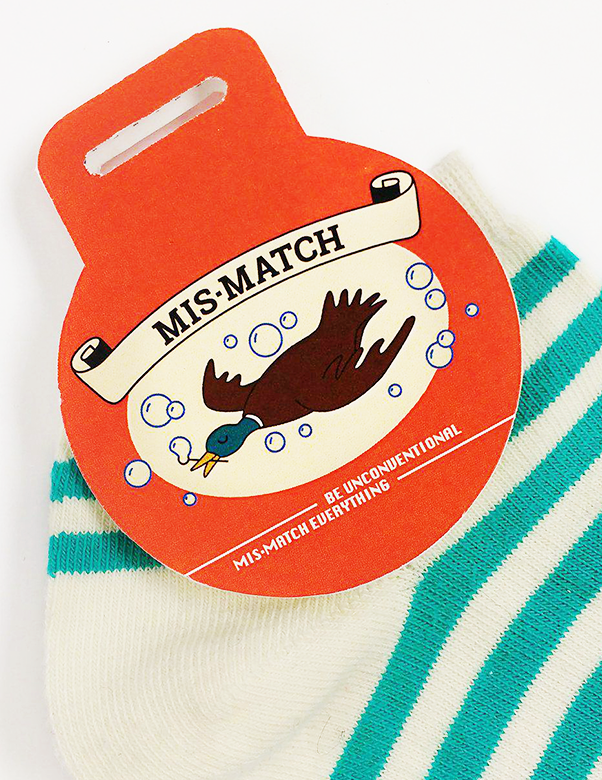 Mis-Match embraces this idea and encourages mis-matching socks as well as helps consumers organize their drawers. This is to better aid them in finding a certain pair of socks when they need it, serving as a functional package in the home. 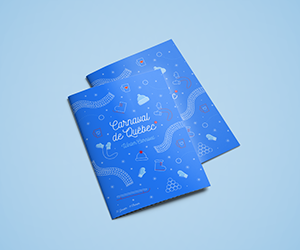 This design focuses on using playful illustrations and bright colours to attract a rangeof different consumers such as; children, people with a love of vintage designand socks enthuses. The main issue with socks is finding the pair you want right away in a drawer filled with socks. 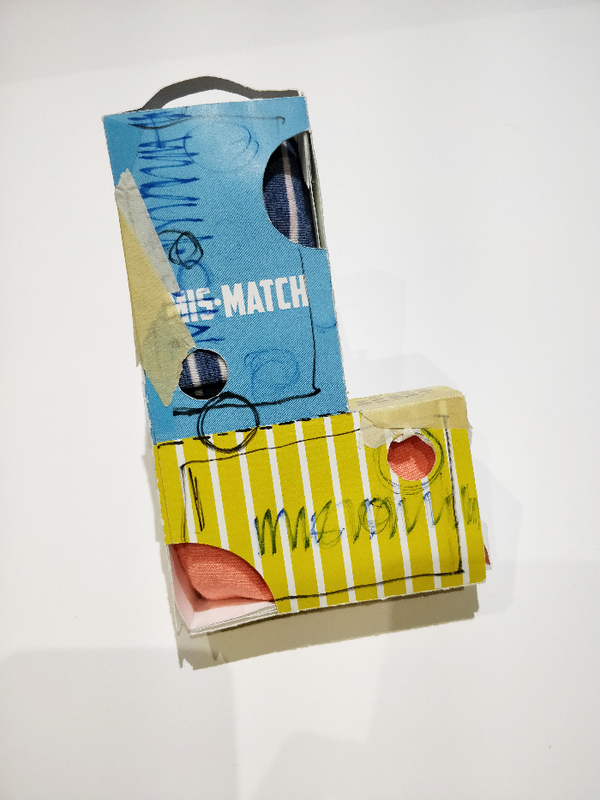 To create a solution to this, Mis-Match allows users to use the inner box socks come in as an organizational tool in their drawers. 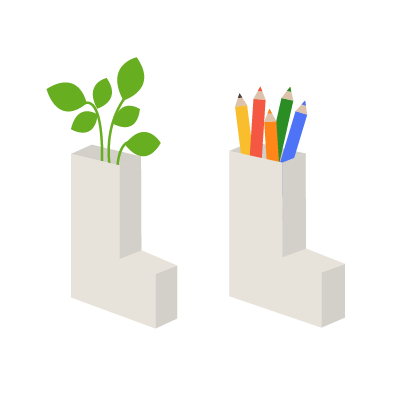 The outer empty box can repurposed for anything from a pencil holder, planter, gift box or as decor! 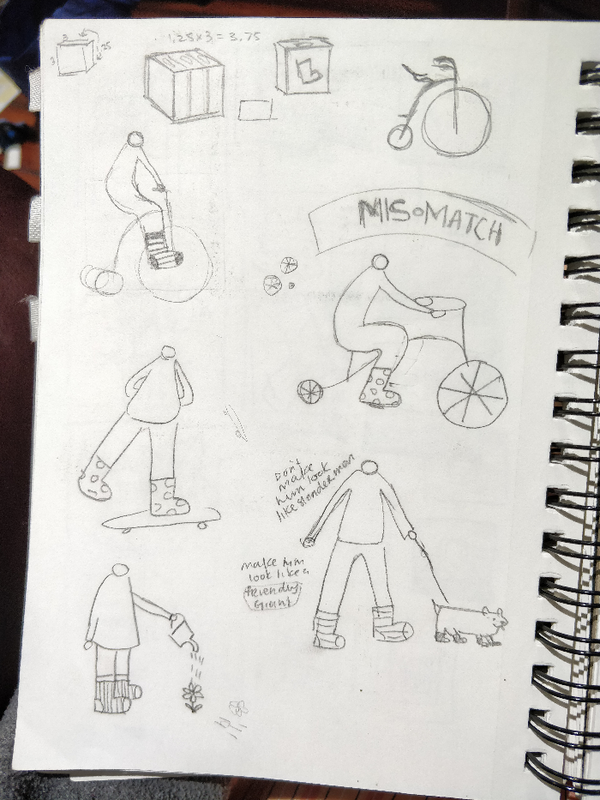 The intial idea of merging match boxes and socks came from a random suggestion that became a challenge. Often people mix up their socks and cannot find the other pair. 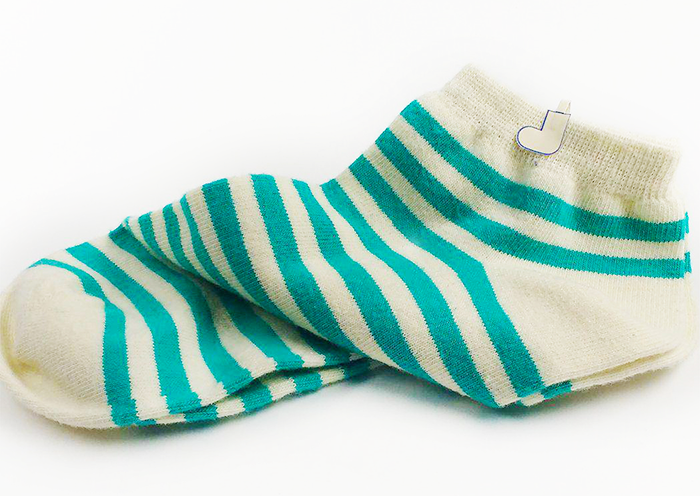 Mis-Match embraces this idea and encourages mis-matching socks as well as helps consumers organize their drawers. This is to better aid them in finding a certain pair of socks when they need it, serving as a functional package in the home. 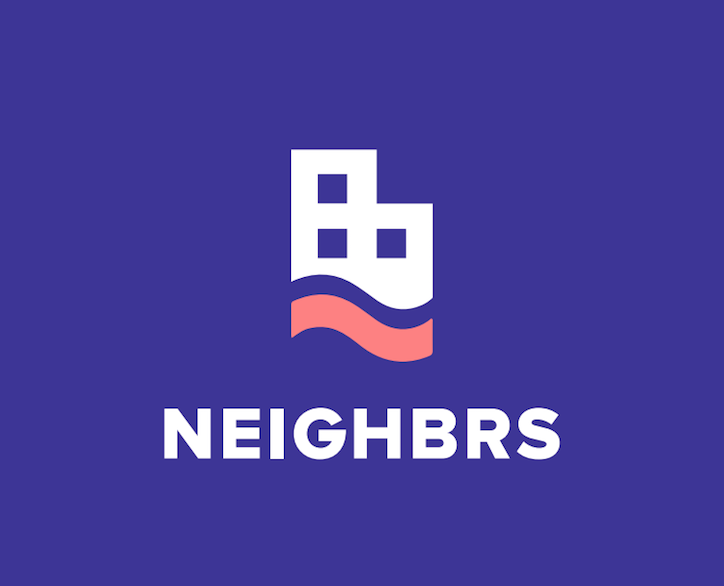 This design focuses on using playful illustrations and bright colours to attract a range of different consumers such as; children, people with a love of vintage design and socks enthuses. The look of Mis-Match came from an evolution of designs that were refined and worked to be a fun and playful look. The idea behind the illustrations was to creates somewhat impossible scenarios as an animal series. 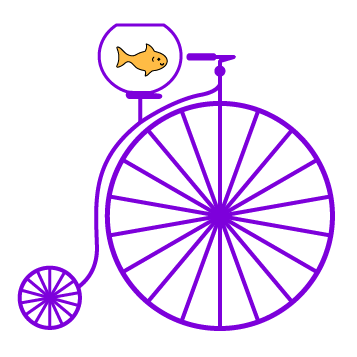 From a Dog flying, to a fish riding a bike, we want to spark kids imaginiations and entertain impossibly possible ideas. Type treatment and the overall look was to mimic the feel of a vintage matchbox. The playful illustrations and interesting look is sure to appeal to both a young and older audience. 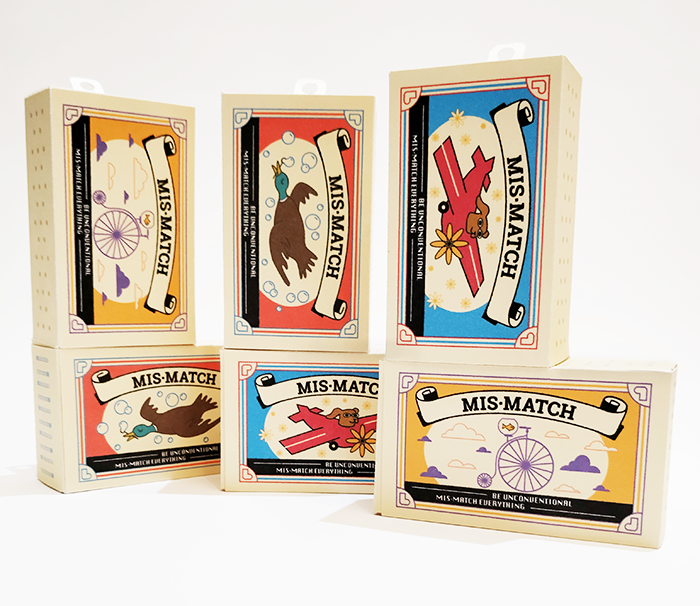 There was a huge amount of trial and error to come to the final package design for Mis-Match. I tried many different styles from a regular box, match box, hanging containers, wood, paper, card board and so on. 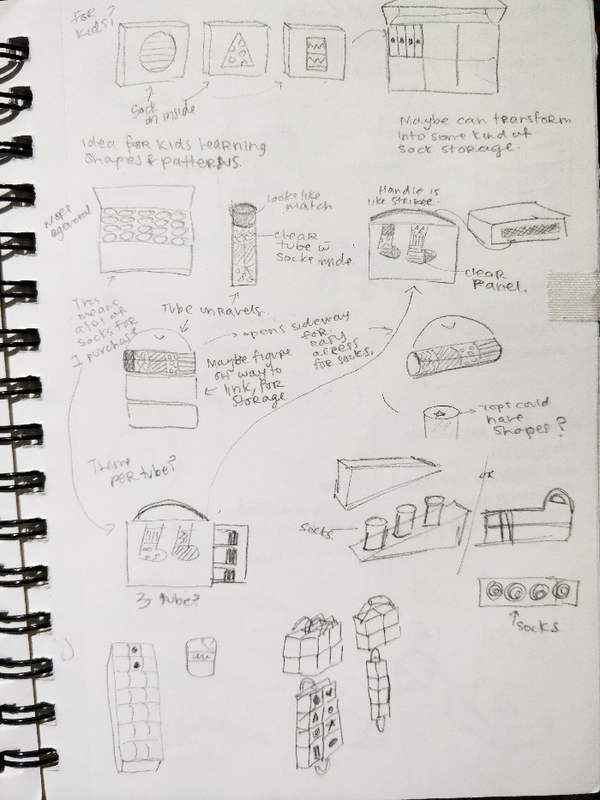 Even with the final design, I went from minimal design to illustrative in the end. With all this test a trial, I was able to come to the best results. 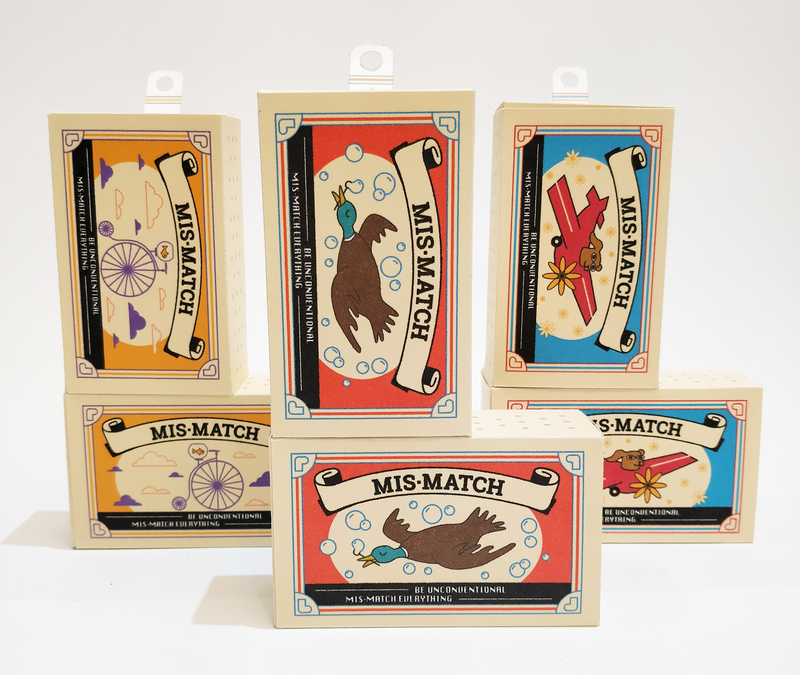 There was a huge amount of trial and error to come to the final package design for Mis-Match. I tried many different styles from a regular box, match box, hanging containers, wood, paper, card board and so on. 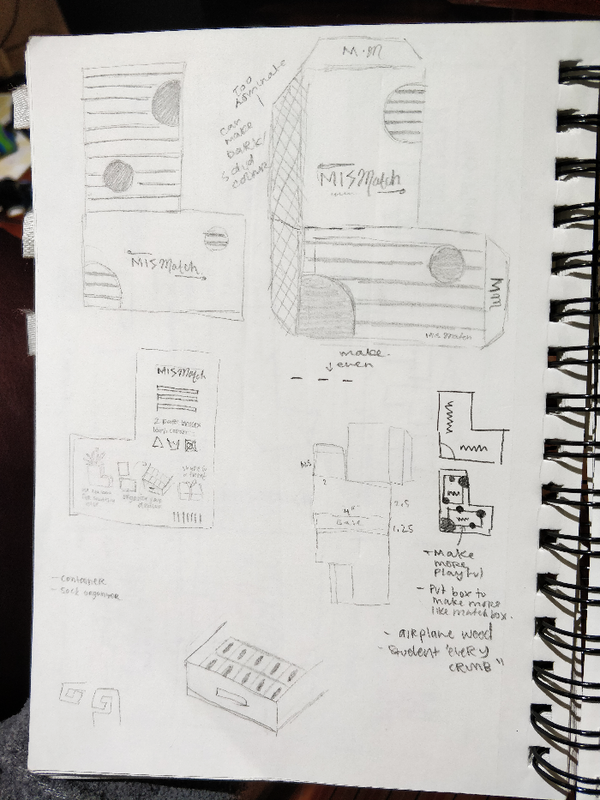 Even with the final design, I went from minimal design to illustrative in the end. With all this test a trial, I was able to come to the best results. to come to the best results. After much refinement with Mis-Match, the final look came out to be quite interesting and fun! 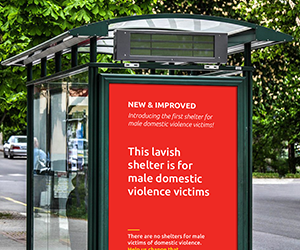 I am very proud of the overall look and functionality of the final package design. 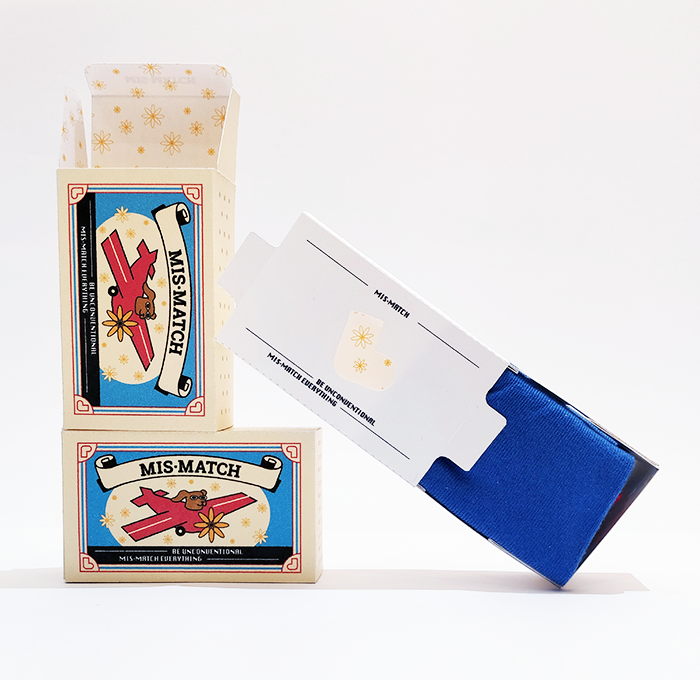 The late nights working on perfecting the sock/matchbox idea was well worth to create such a unique design. I would be interested in expanding and further refining this project to have other "impossible" illustrations, as well as experimenting with different materials. The possiblilites are endless! 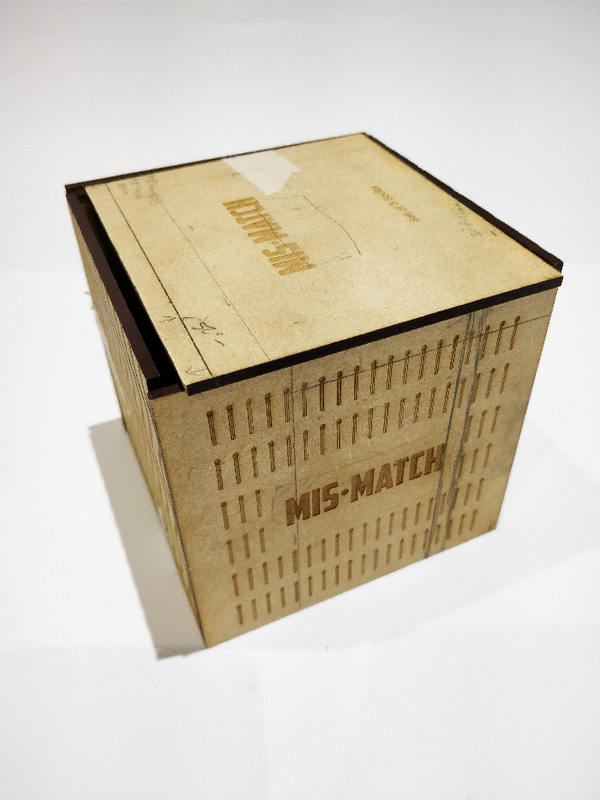 There was a huge amount of trial and error to come to the final package design forMis-Match. I tried many different styles from a regular box, match box, hanging containers, wood, paper, card board and so on. 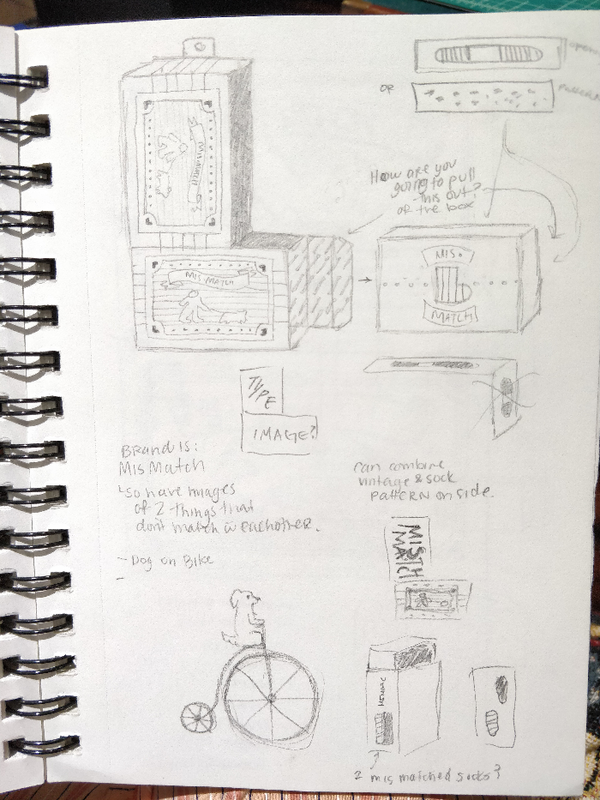 Even with the final design, I went from minimal design to illustrative in the end. With all this test a trial, I was able to come to the best results.